Chief Operating Officer, Staffing 360 Solutions, Inc.
Alicia is currently the Chief Operating Officer at Staffing 360 Solutions, Inc. She is a dynamic, highly-regarded HR Executive and Certified Professional Coach. She brings 20 years of experience from a variety of fast-paced, competitive industries. She has served in leadership roles for publicly traded companies, independently-owned boutiques and international advertising agencies. Ms. Barker has managed large teams and provided professional development and Executive Coaching to a wide variety of professionals. 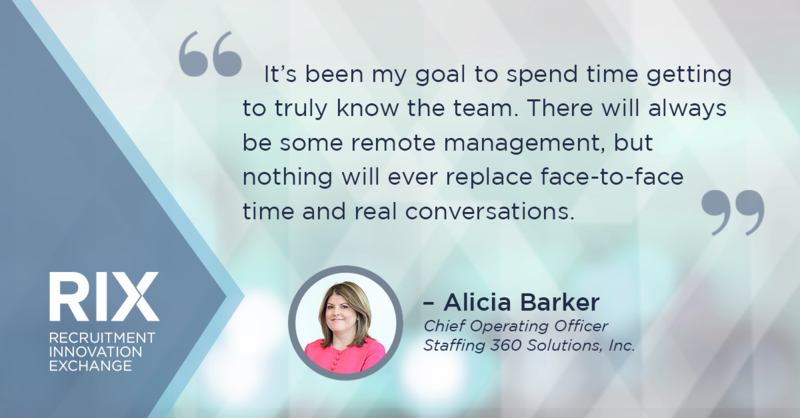 Bullhorn’s Vice President of Global Enterprise Strategy & Operations, Leah McKelvey, recently sat down with Alicia Barker, COO at Staffing 360 Solutions, Inc. for a frank and honest conversation about her journey to the C-suite and the challenges and opportunities she faces. Can you share a little bit of your journey back to the staffing industry? In the mid-2000s, I ran the HR function for Hudson North America, where I led efforts across the 37 offices we had at the time. While working at Hudson I met our current chairman and CEO, Brendan Flood, who was serving as CFO before he moved to London. We had a terrific partnership at the time and a great deal of camaraderie. Brendan was the initial pull back into staffing, but it was the opportunity to have such a significant impact at Staffing 360 (STAF) that drew me back in. In the years between Hudson and STAF, I had a variety of other valuable experiences. I left my role at Hudson when I had twins, who are now 12. During that time I stepped into our family business and took a leadership position. My ex-husband owns and is the Creative Director for a very successful advertising agency, Barker Advertising and Interactive. The agency was experiencing some significant turnover and inefficiencies so he asked me if I would come in and spend some time sorting that out. I worked at the agency part-time for several years and then worked there full-time running the operations of a team close to 40 people. We reduced our turnover to zero and it was a phenomenal experience for me. I miss the people at that agency every day. Working with my husband was not a great life choice; we are both type-A personalities so I decided to step down from the agency and focus on a passion of mine – coaching. I started a business and started coaching women that were looking to go back into the workforce or who needed to make substantive changes to their working style. I focused on women who often felt like they had lost their mojo and needed to build confidence to re-enter the professional world. It was some of the most rewarding work I have ever done. When I re-emerged on LinkedIn, Brendan and I reconnected and I started consulting on a business transformation going on at Staffing 360 as they grew. After a few months, I came to a board meeting to present some of my findings on the team and organizational opportunities which turned into an engaging discussion. From there, I was appointed to the Board and then ultimately, Brendan offered me a full-time role to join the executive team to provide strategic guidance, leadership to the management team and to run HR, Operations and Compliance and Internal Communications for STAF. The timing was right for me so I decided to dive in head first and embrace the opportunity! What are you and the Staffing 360 team most looking forward to in the coming year? We’ve grown considerably and are in a strong position to head into the new year. A priority is the business performance required to drive our stock price which is undervalued. The way that the company is currently operating is dramatically different than how it used to be. There wasn’t the cohesion to drive the business as quickly and aggressively as we wanted. We did an internal and external branding exercise where we brought key managers in that hadn’t worked together before. It was pretty significant in restructuring from the internal support standpoint. I’m excited about the size we are now and the involvement we have from the broader leadership and field teams as one person can make a sizable difference. People are truly embracing the opportunity to contribute at a broader scale. How has the role been so far? There’s nothing that’s been easy. I would be lying if I said that. I think the most significant challenge that I face right now is making sure that our operational infrastructure can catch up to the speed of our recruiting and sales operations. Our operations weren’t previously in the position to support that. Getting that infrastructure humming in finance, IT, marketing, HR, and internal comms represents a challenge as it involves fairly significant change, at a rapid pace, which is hard for everyone. A lot of things need to be accounted for. Legacy businesses have a historic tie to their classic way of doing business – but you’re also asking them to join together with a larger organization, and some have to let go of historical ways of doing things. We’re also focused on building the customer service culture which has always been core to driving our success. Sometimes this word “back-office” is thrown around and it was still used in our company. That wasn’t acceptable to me as they’re such a critical component of our team success. We addressed the importance of the function and the fact that people need to know it’s a see-saw and that one side supports the other. I’m very proud of what our operations team is capable of doing. Our pace, our operations, and our commitment. I want our teams to take a lot of pride in that. How did you know what levers to pull first? And what’s next? I’m definitely drinking out of a firehose but I prefer it that way so that I can really understand what’s happening in the business. And my boss understands and appreciates the value of thoughtful consideration. You need to be in the job a while to know what you need and to evaluate your staff before you bring new people in or make changes. I have re-organized some aspects but I haven’t made any changes of huge significance yet. Two months is not enough time. Three to six months is the right time to do some reorganization if necessary. It’s about getting people to deliver differently. Being motivated and invested – in the majority of cases, it’s not the staff and the team, it’s the way that the team is being led. It’s been my goal to spend time getting to truly know the team. There will always be some remote management, but nothing will ever replace face-to-face time and real conversations. The travel has been extensive! But my family and I discussed that when first evaluating the opportunity- and knew the upfront of this would be tough. As a visual learner, I have a map in my office with a bunch of pins just so I know if I’ve over-hit one area or not spent enough time with others. I’ve made it my business to get around as I believe that before I can lead our teams remotely to work to their fullest potential, I have to establish some baseline relationships. In ideal circumstances, I could be in the UK every month but that’s not feasible for me right now. I spend at least a week of face time with the UK leadership team every quarter and have met almost everyone in the office as part of the transition process. I’ve been focusing on gradual development. It’s important to take the necessary amount of emotional energy to connect with people. I know some people in leadership positions who intentionally stay somewhat guarded as a leader, whereas I’m the opposite – I make it my business to get close to people. The more real relationships I have, the more likely I am to help them and impact the business, and the more likely they will come to me if there is a problem in the future. What has it been like being the only woman on the board? Or sometimes the only woman in the room at leadership meetings? One of the things that I want to make sure that I say out loud is that it’s a blast! I came on to a board that didn’t have any women, I came onto a leadership team that didn’t have any women, I work with a lot of men but I don’t feel a divide. The rest of the team treats me the same way they treat one another and if anything, I think I provide a healthy balance. We are an executive team, no one is defined by who is a man and who is a woman. Every person in that room is strong, opinionated and has a thick skin. You have to! The team has been incredibly welcoming to me and at times, I’m the kid sister, but I love it. I don’t feel at all that I can’t be my outspoken self. If anything, a large degree of my success is that I’m willing to have conversations that a lot of people aren’t. I’m willing to talk about a lot of things with people that other people won’t or shy away from it as it’s uncomfortable. People ask me, “How are you going to have that conversation, it might be awkward?” I think that’s where you see real growth. That’s where you have moments of change and where people have an insight. Most people appreciate the frankness of a conversation if it’s delivered with some grace and sensitivity. That’s one of the things I bring to Staffing 360, maybe from a female perspective, that some others might find awkward. How would you describe the leadership team right now? How do they help you perform to your best? We have a really tight team right now. I would describe the leadership team as driven, transparent, tenacious and motivated. I think that drives a lot of company success. We are baking the right recipe. I’m very excited and hopeful – and we are all a little tired. I predict another six months of it before there is a light at the end of the tunnel and we take a breath. Brendan is a pretty phenomenal leader. It’s hard to complain when you’re working as hard as you can, and your boss is working harder. No one is working harder than our CEO. We’re all running behind him trying to keep pace. He’s very demanding as a boss, but he’s fair. He’s more than fair. You need to be pretty internally driven and have high standards for yourself to succeed with him. As skilled as you are at what you do, he will make you better and he will make you look at things differently. He can pinpoint the needle in the haystack in one-second. He’s also a very good human. There are always amazing nuggets from Brendan that I use with my team. There was a time that we were having a heated conversation with a lot of differing opinions. He must have been able to tell from my body language that I wasn’t bought into the direction. He said, “Not only do you have a right to an opinion, but you also have a duty to an opinion.” This stuck with me because if you don’t have an opinion as a leader, you shouldn’t be there. It’s powerful – and also empowering. When I disagree with him, I always remind him that I have a duty to an opinion! It’s always a team dynamic when you have something special going on. Brendan is like Winston Wolf of Pulp Fiction. He can solve any problem – I would never bet against him. We have a strong team and it is getting stronger. We have to prove ourselves to our shareholders and drive the profitability of the business and do that in a way that is inspiring to our internal staff and gets them engaged. We will continue acquiring, but one of the greatest challenges is keeping your eyes both in front of you and behind you. Staying focused on these external acquisitions while you’re focused on internal growth, the economic model in place, and taking care of your staff. I’m invested in this opportunity and in this team for the long haul and I hope that this will be a significant stop in my career. I have no desire to look at other opportunities right now as I think it would be really difficult to find something quite as appetizing.